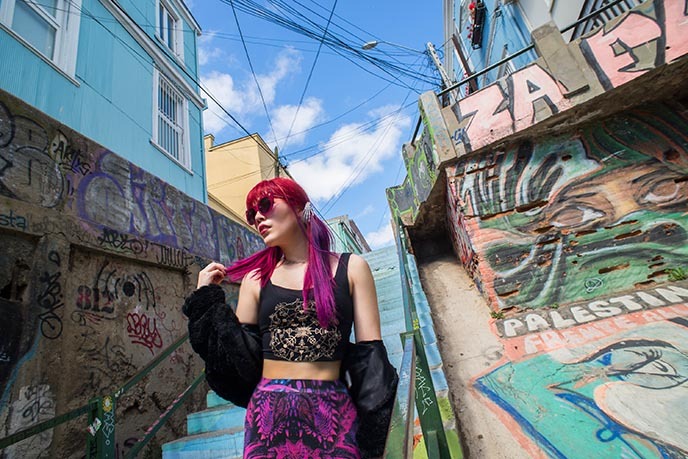 Space Goth fashion & Street Art in Valparaiso, Chile! 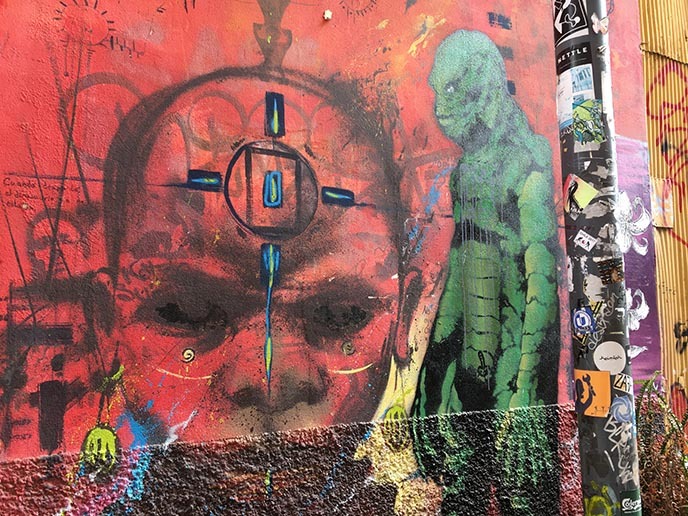 Cool colorful murals, graffiti walking tour. 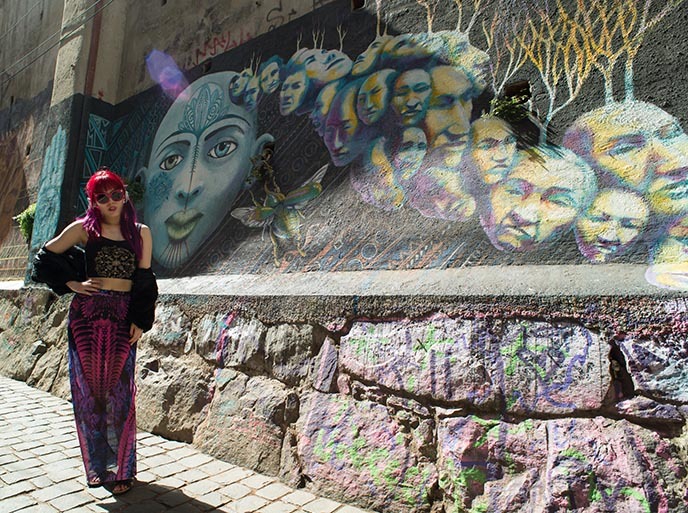 Space Goth Mermaid is the theme of the day… because I’m in colorful Valparaíso, Chile! 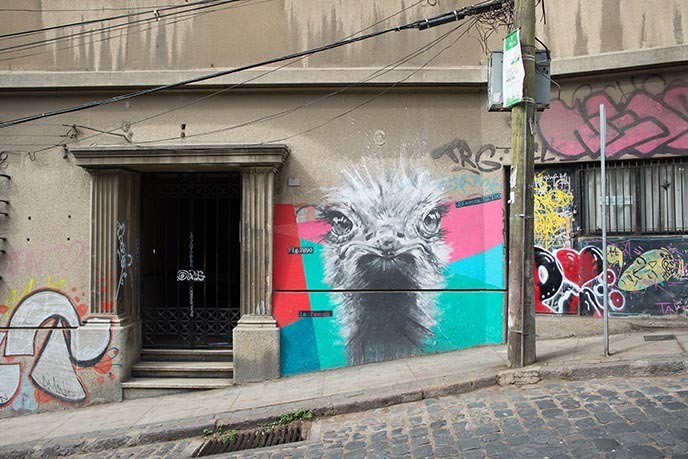 “Valpo” is a UNESCO World Heritage site, and boasts some of the best street art in the world. 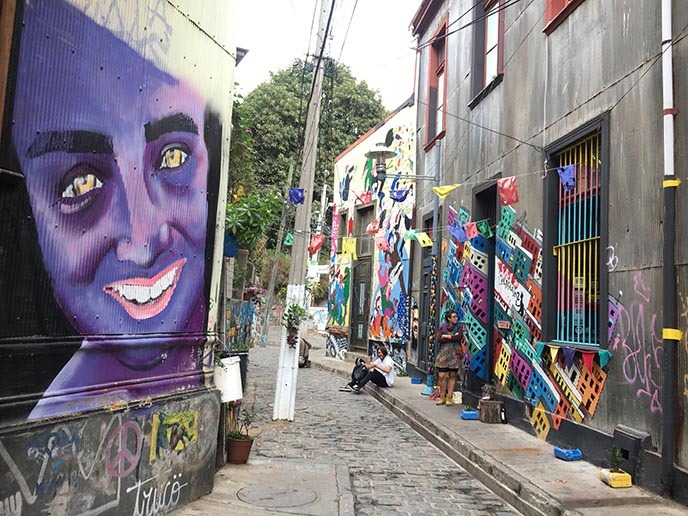 This hip, rainbow-covered city is only a 1.5 hour drive from Santiago — making it a perfect day trip during my LATAM Airlines adventure in South America.. 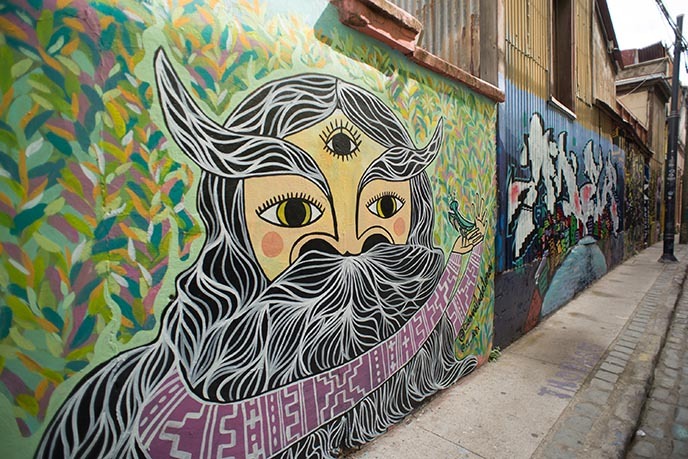 If you’re an art and culture seeker, you will adore Valparaiso’s vibe. 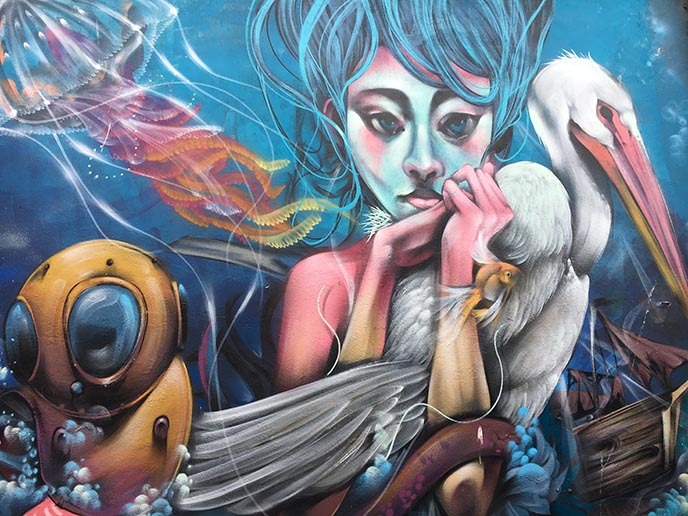 Artists from around the world flock to this Chilean port city, to add their works to this open canvas. 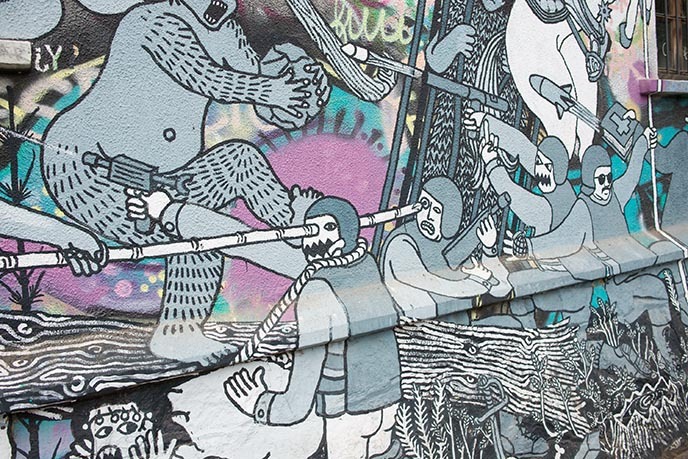 Walking around, you’ll come across wall-sized murals, graffiti, found art, 3D installations… sky’s the limit, when it comes to creativity in Valpo. Santiago is a popular hub for LATAM’s many domestic and international flights. 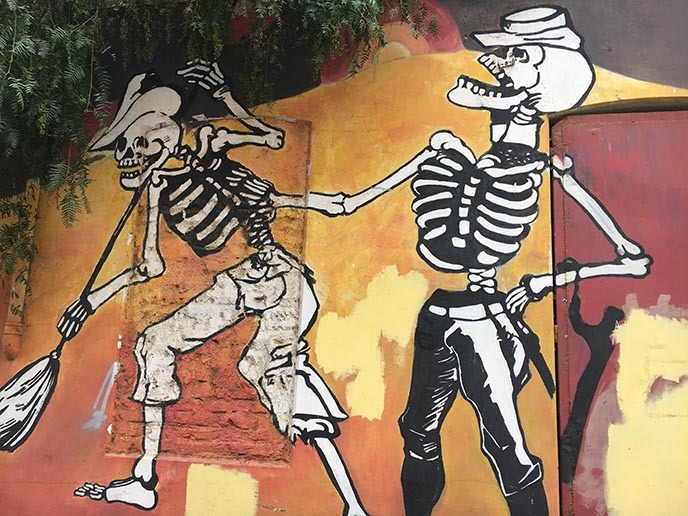 If you’re in the capital of Chile, I urge you to take a day to explore the nearby Valparaiso. 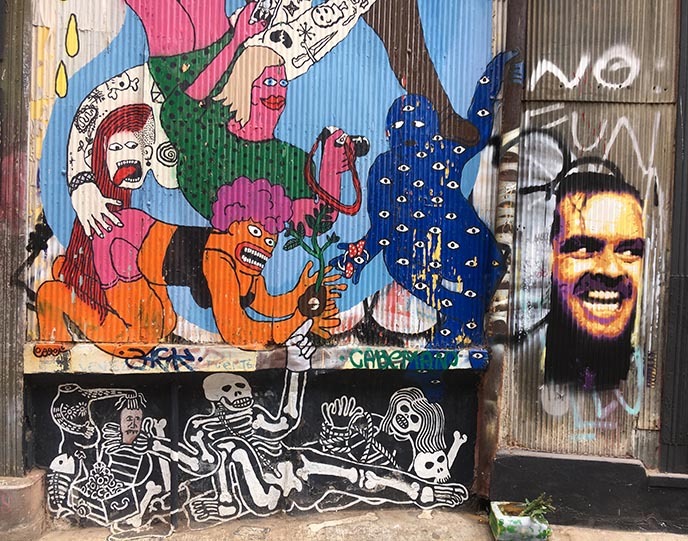 It’s an inspiring place to walk around, find unexpected art (some of it with political themes), and take a million photos. 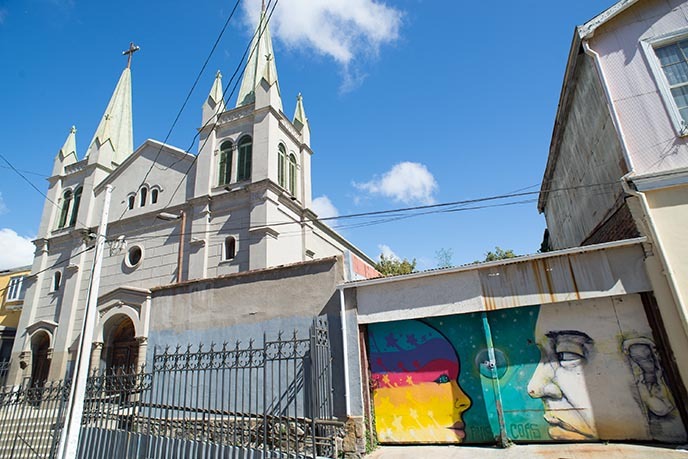 How to travel here: Valparaiso is located 120 kilometers west of Santiago. To get here, we rode the metro (subway) to Santiago’s Pajaritos station, near the end of the red line. Then, we bought roundtrip tickets for the bus that leaves every 30 minutes or so for Valpo. There’s no need to book in advance, as there are plenty of seats especially on weekdays. When you arrive at Valparaiso bus station, you can look for the tourist information booth in case you have questions. The staff can help you find the local bus stop outside. Ride it to Plaza Sotomayor, the large central square. 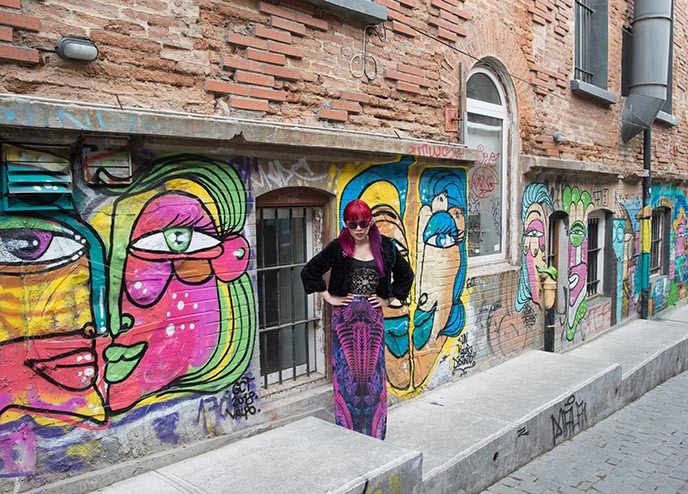 From Plaza Sotomayor, you can take the old elevators up the various hills to see street art. 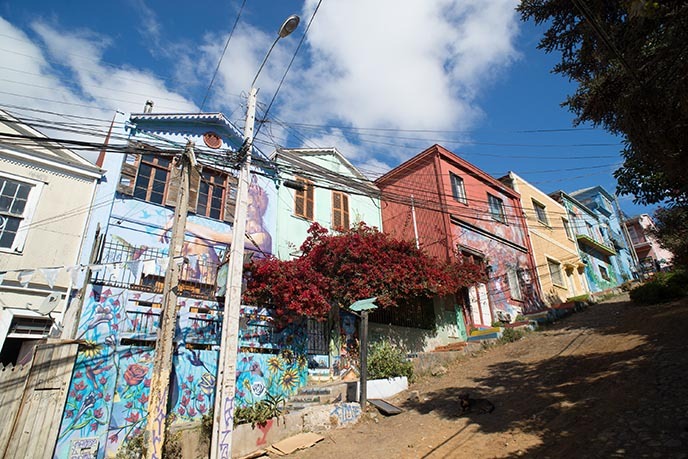 Valparaiso has over 40 hills, stacked with brightly colored houses and public art. There are quite a lot of stairs and slopes, so be sure to wear comfortable shoes and bring sun protection. I put together a “Space Gothic” outfit of the day. 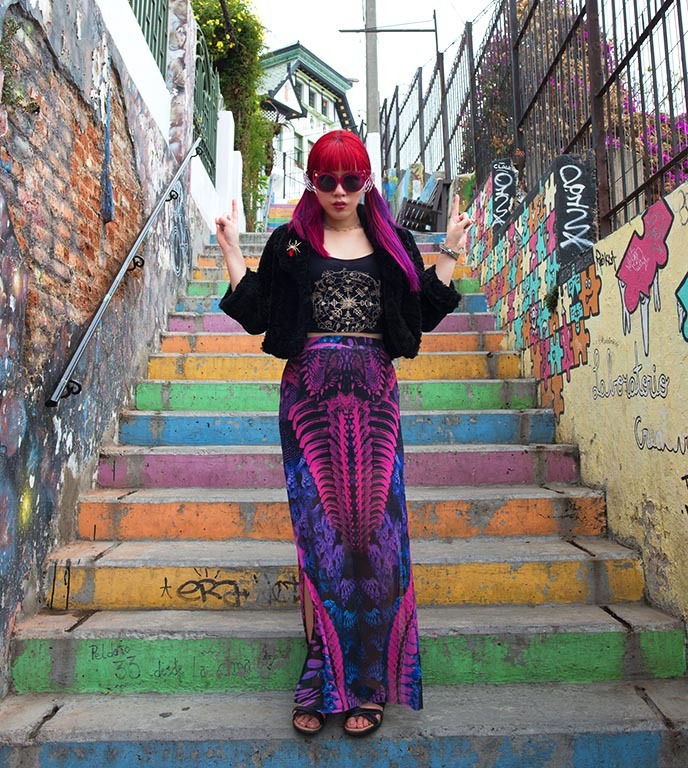 I combined Goth with cyber-galaxy colors that match my hair, as well as the murals around me! If you aren’t keen on walking up and down hills, you can use the funicular “ascensors” built in the 19th century. There are 15 of these rickety metal elevators, which take you up the slopes for a few coins. 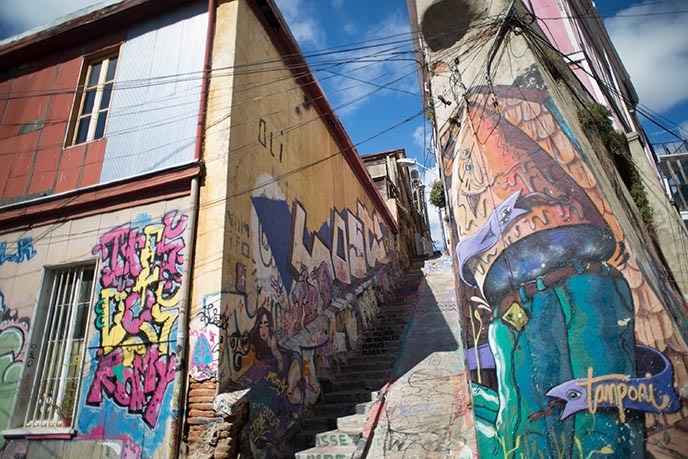 Some of Valparaiso’s districts can be a little sketchy (we were warned to be careful with our DSLR camera and belongings). To avoid any issues, I recommend that you stick to the main sightseeing areas. In any case, that’s where you will find most of the street art! 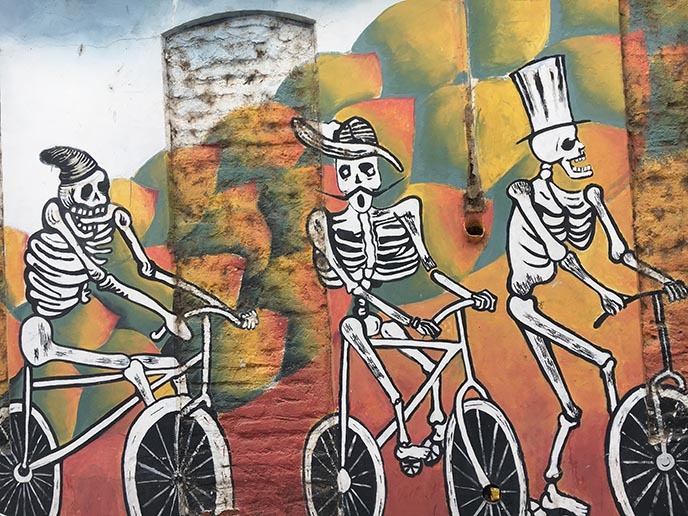 What’s the best way to get around Valparaiso? I recommend that you take the funicular or walk up El Peral. Once you reach the top, you’ll find a glorious view of the water, as well as an old palace and a fine arts museum. 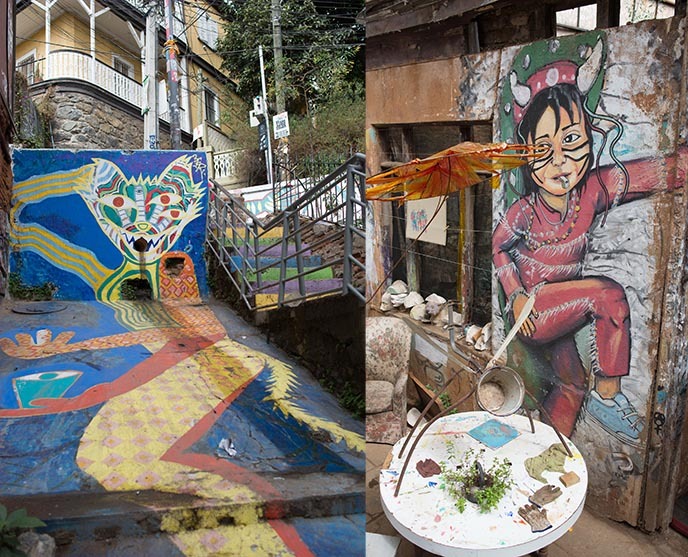 From there, you can stroll around and enjoy the colorful works around you. 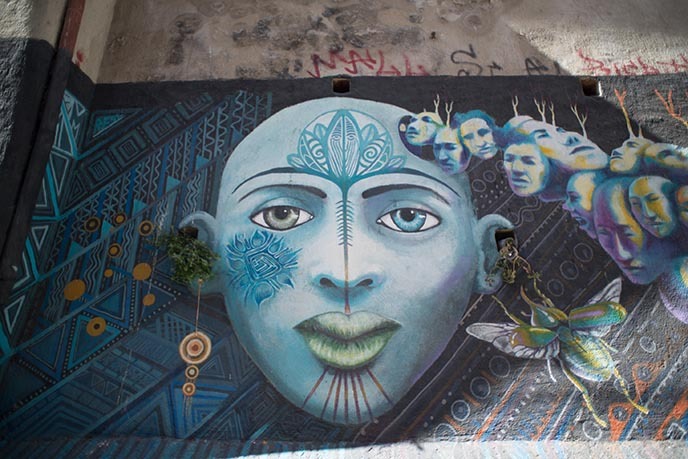 The murals have wonderfully diverse styles and subjects. As a horror fan, I was delighted to see the Creature from the Black Lagoon! 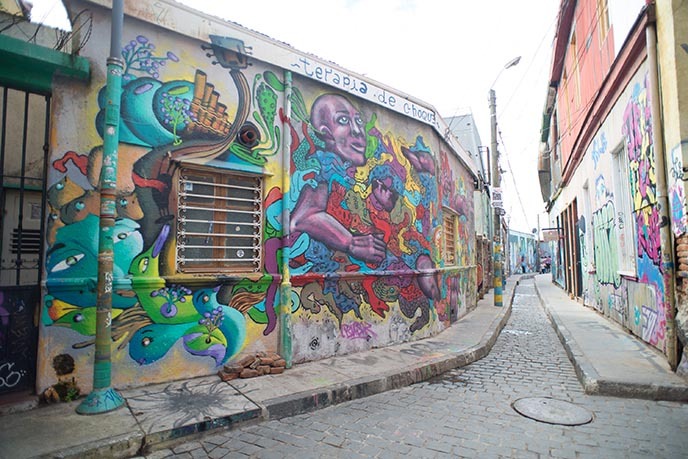 While you will find street art all over Peral, the main streets are Monte and Cerro Alegre, Capilla, Miramar and especially Templeman. How did Valpo become a tableau for worldwide artists? Around the 1920s, Mexico had a burgeoning muralism movement. 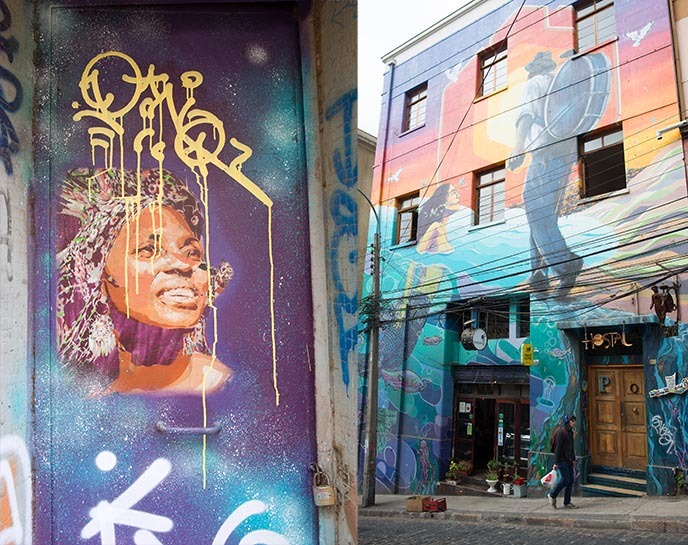 This inspired Chilean poet / diplomat Pablo Neruda to invite artists to come to his city, and get creative. 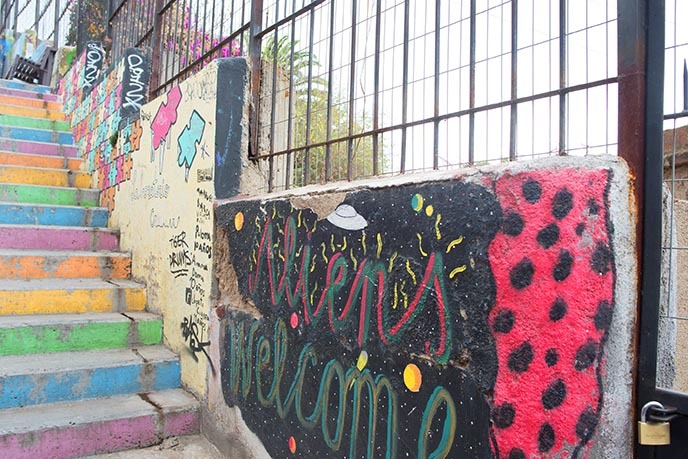 Valparaiso was already known as the “Jewel of the Pacific” for its beautiful Pacific Ocean setting. 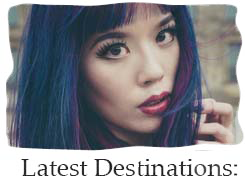 However, now it’s best known as a laid-back, hipster destination covered head-to-toe in eclectic art. 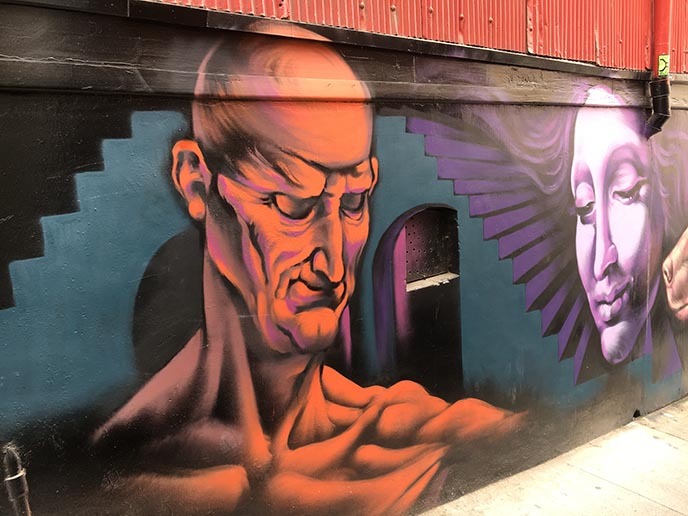 It’s a great place to art-walk, followed by a leisurely meal of empanadas and pisco sours at a local cafe. I enjoyed seeing the contrast between old and new. 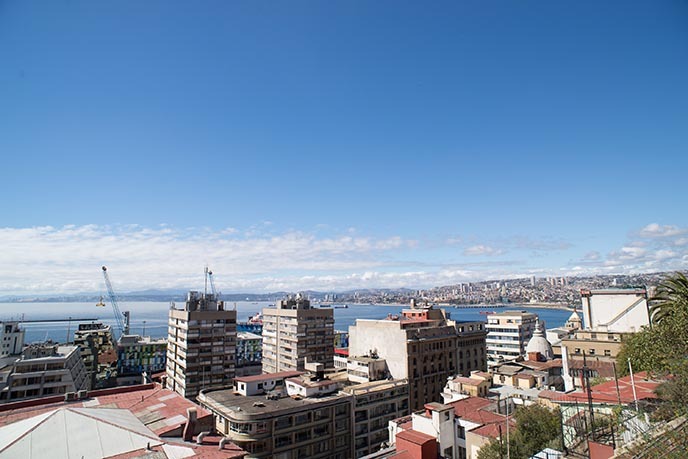 Valparaiso was a major seaport in the 1800s, during Spanish Colonial times. Today, these churches and palaces stand next to quirky murals. Many local buildings invited artists to decorate their storefronts. 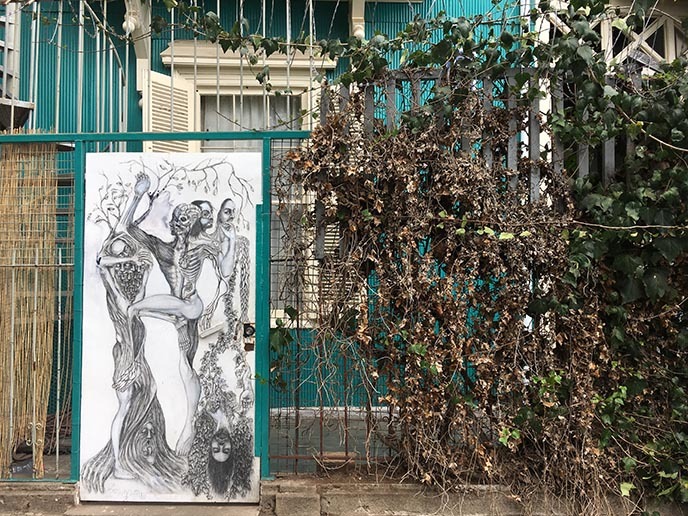 I was amazed at the variety of works throughout Valparaiso: from graffiti tags, to intricate portraits, to three-story narratives. “Aliens welcome.” This sounds like my type of town! I’m wearing a spider pin that reminded me of the one Cheryl Blossom wears in the Riverdale TV series. My spider brooch got stolen from my luggage.. but thankfully, it was only a $7 pin that I got here! 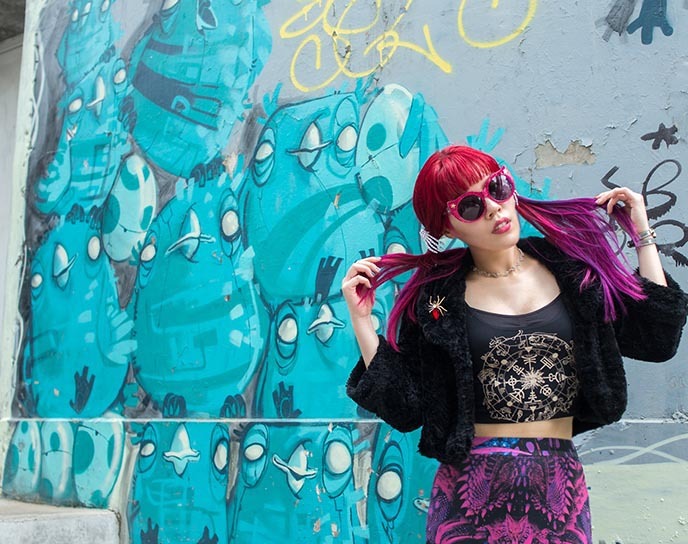 Outfit details: cyber spine skirt from Salemonster, sunglasses from Irregular Choice. 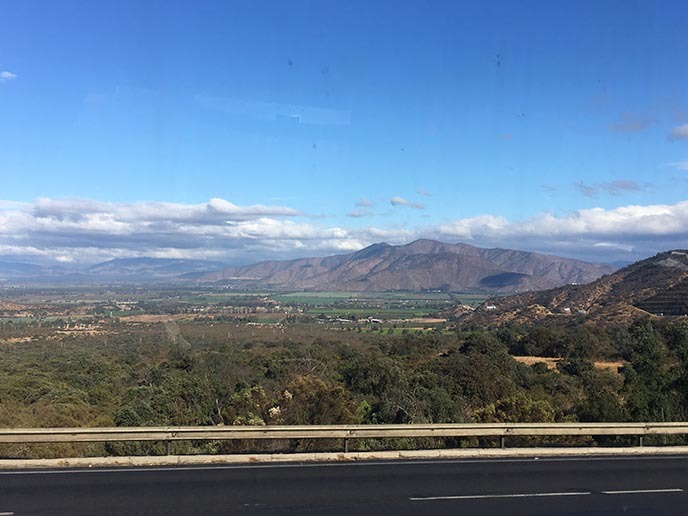 There’s so much to see in this port city with dozens of hills. Some people join a guided walking tour, in order to see the highlights. We preferred to walk around on our own, and come across gems like this ostrich by chance. 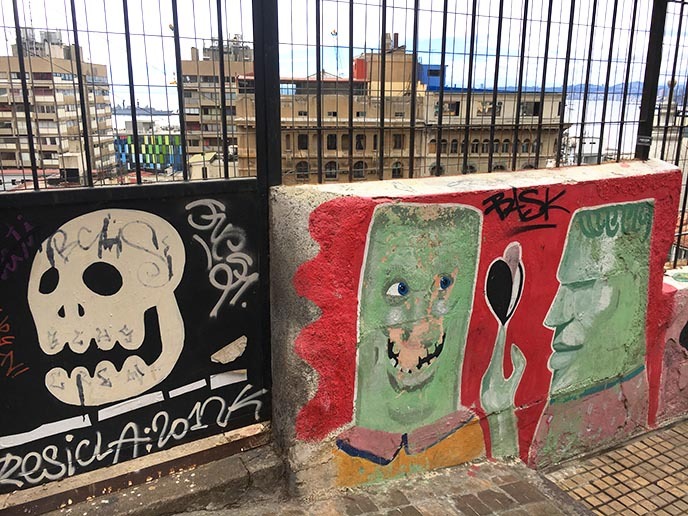 It’s impossible to see all of the paintings in Valparaiso, and artists are constantly creating new works. I enjoyed taking snaps of whatever caught my eye. 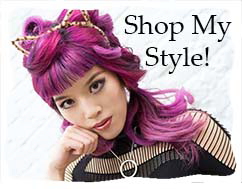 A drainpipe refashioned as a cat-girl’s mouth, a studio with sculptures made with found objects. Some of the most interesting works convey a socio-political message. This one is a graphic commentary on religion and colonialism in South America, and the oppression of native Chileans. I was impressed by the level of talent found in Valparaiso. There’s a sense of community among the (mostly young) artists as well. Even the streetlamps and drainpipes get a technicolor makeover. The local government supports creators with workspaces and resources. The result: glorious murals like this one. This serene, blue “happy hippie” face was one of my favorites. Note the greenery growing out of his ears! Closeup on my Riverdale spider brooch from here. My silver necklace is by Aurum by Guðbjörg. Not all parts of Valparaiso are accessible for everyone. Be prepared for a lot of walking, including up and down lots of stairs. 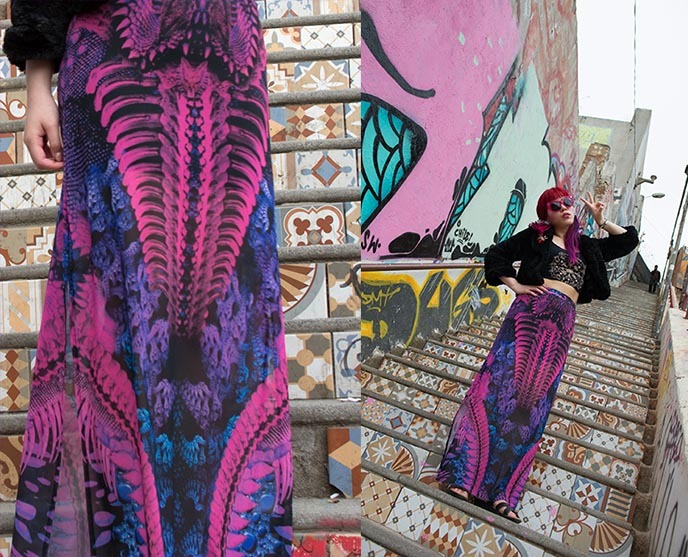 How beautiful is this mural? If I came back to Valpo, I’d join a guided tour so that I could learn more about each specific artist. Look out for the uniquely decorated stairs. This one looks like a kite, if you view it from a distance (see the diamond on my left). Another staircase looks like piano keys. At the top of ascensor Peral, take a moment to enjoy this panoramic view of the city and bay. And don’t miss out on the tiny details. 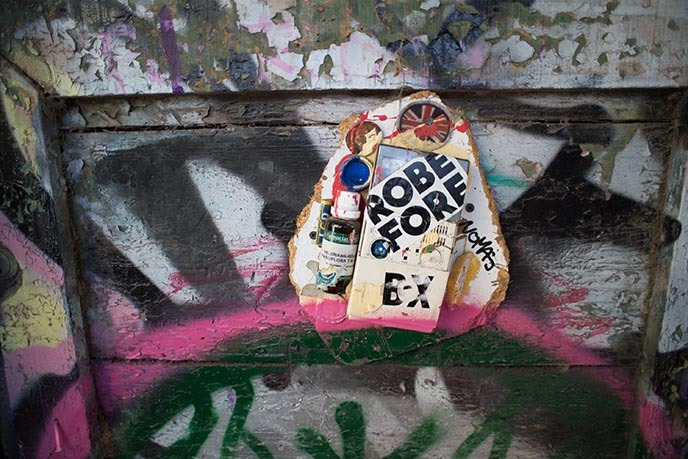 Street signs, telephones and other unexpected objects get an artistic transformation here. How sweet it must be for these local residents, living / working / studying / playing amidst these colorful creations! 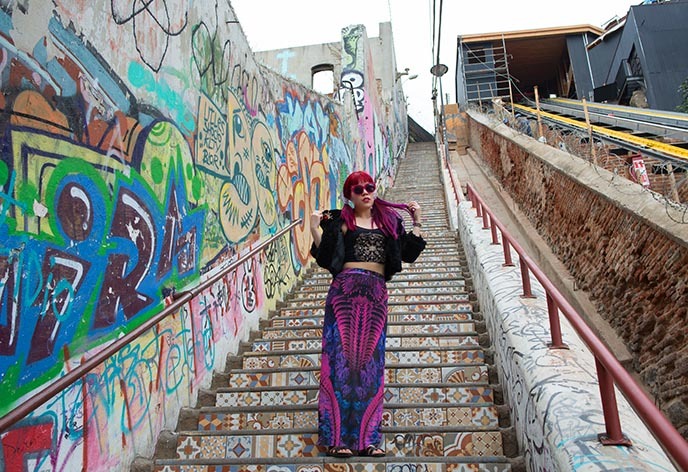 These mosaic steps next to the funicular called out for a photoshoot. As I explored, I took snaps of skeletons and other Gothic creatures (as I thought these would be of interest to you!) Here’s a cheerful fellow riding a bike. A smiling skull, and two Frankensteins. Is he holding a clam on his fingertip? Some of the skeletons had an anatomical feeling. 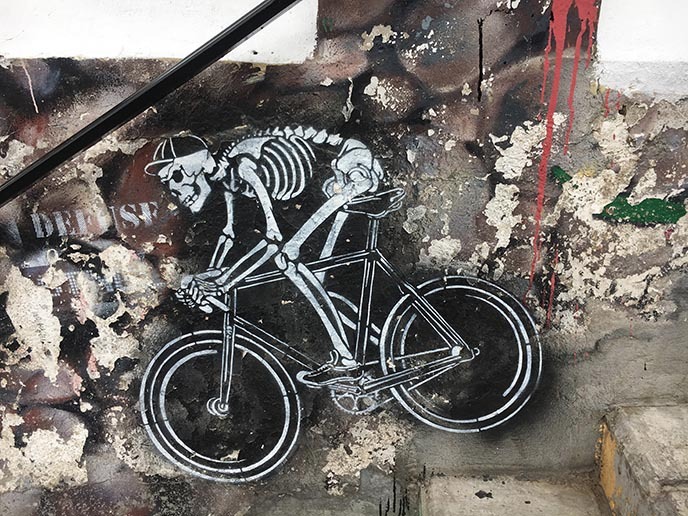 Others reminded me of the naughty Day of the Dead skeletons I saw in Tulum, Mexico. 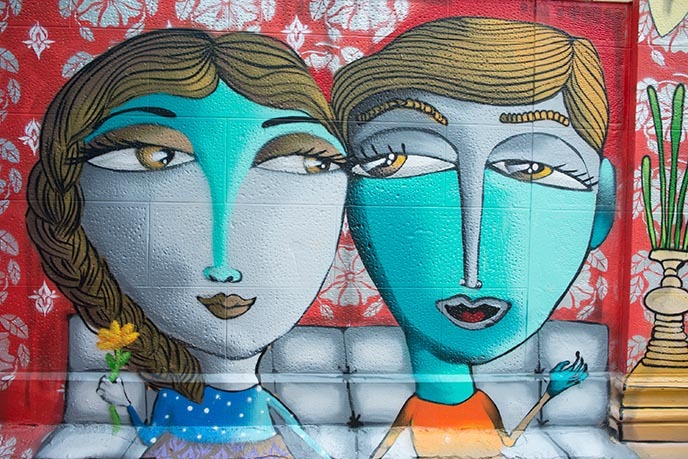 Isn’t this “street art city” a wonderland? 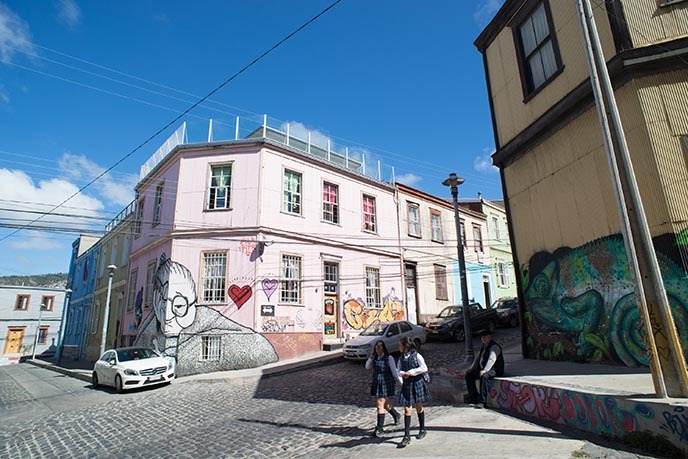 Have you heard of Valparaiso before this story? 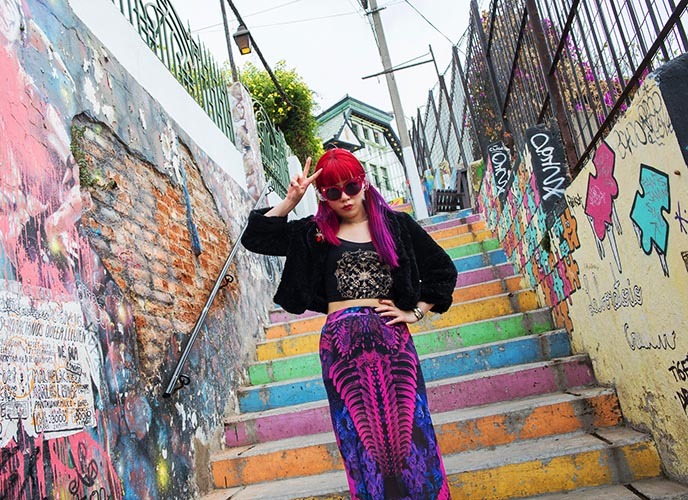 Perhaps these images may inspire you to book a flight to Chile on LATAM Airlines, and climb this rainbow staircase for yourself! 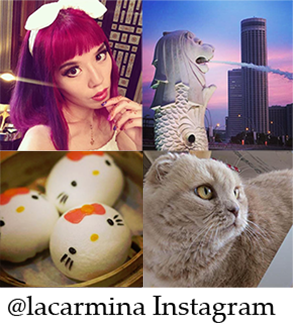 Thanks for sharing, LaCarmina! Really enjoyed the beautiful photos!